This is Part 2 of a series. Read Part 1. The new Illinois food donation law for schools allows schools more control over lunchroom food and encourages the donation of leftovers. SCARCE supports food sharing and has some advice on next steps. Since this is new territory for many schools, we want to start with something easy. The simplest step is to start a small program right in the lunchroom. Enter: The Sharing Table. 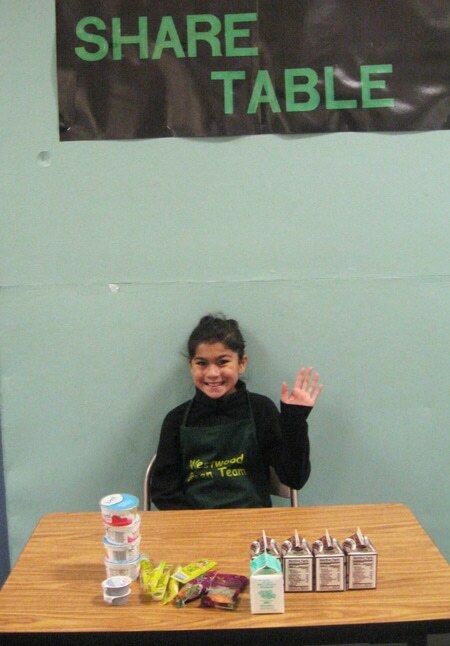 A student monitors a food sharing table at her school. A sharing table is just what it sounds like. It’s a table in the lunchroom set aside for kids to place food that they are not going to eat. It is for food or beverages that have not been opened (in the case of packaged items such as a bag of baby carrots or milk cartons) or bit into (in the case of unpackaged food, such as whole fruits) – nothing homemade allowed. That food is then up for grabs – for free- for any interested student. The sharing table does not, in fact, even have to be a table. In some schools, it’s cart that gets pushed around, perhaps helpful for shy children that don’t want to get up in front of the whole lunchroom. Some schools use a basket or crate near the R.O.T bins (Recycling, Organics, and Trash). 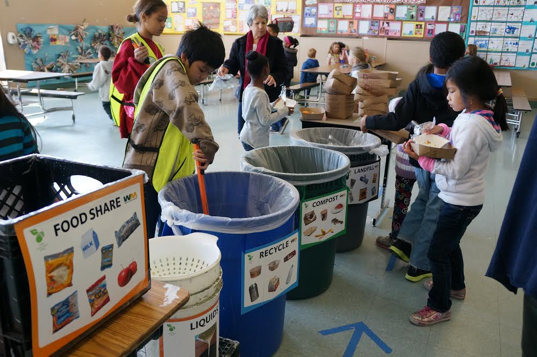 All it takes is a little monitoring to make sure only whole, uneaten foods are being shared, which students from a school’s environmental club, for example, can help with. Any child can put food on the sharing table, and any child can take food from the sharing table whether or not they bought a lunch at school. If you want to keep it simple, start your school with pre-packaged food and beverage and whole fruits and vegetables from school-provided lunches only. Encourage students that pack their own lunch to take leftovers home. If you want to go further, contact your local health department to see what needs to be done in order to share other items. If you find that you have extra food at the sharing table at the end of lunch, work with the school nurse, before/after school program directors, or the school social worker to get the food to hungry students outside of lunchtime. As with starting any new program at a school, the more people you involve – especially students – the more success you will have. Try recruiting students from a club or class to make signs for your sharing program. Do be aware of food allergies in the lunchroom. Signs warning students with allergies not to take items from the sharing table may be a good idea. Train students to help monitor the sharing table or cart. The USDA and US EPA set a national goal to reduce food waste in the US by 50% by 2030. 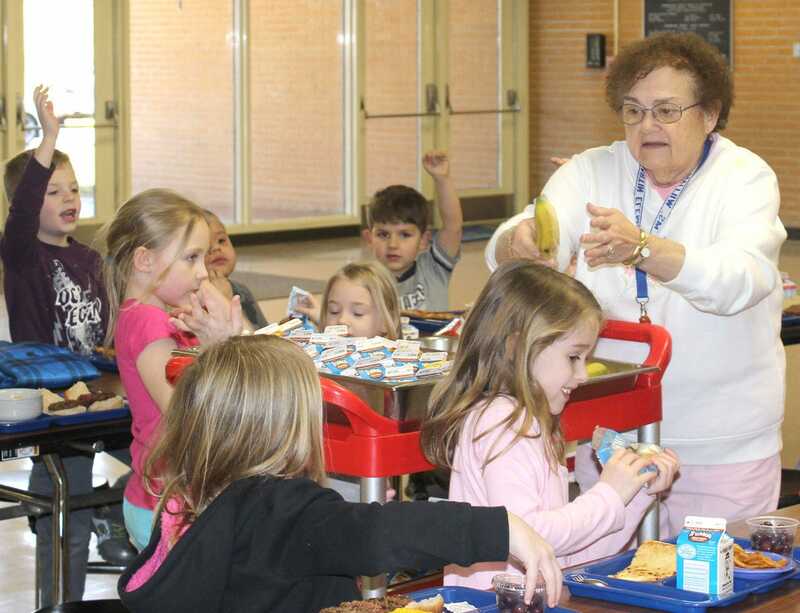 As such, the USDA is in full support of food sharing programs, noting that they are an “innovative strategy” to encourage kids to eat healthy foods and reduce waste in the food programs that they fund. Get the details from USDA’s memo on food sharing programs from June 2016. USDA further encourage states to support efforts to create food sharing programs. Just make sure your school is in compliance with state and local health laws, which may require a phone call to your local department of public health. 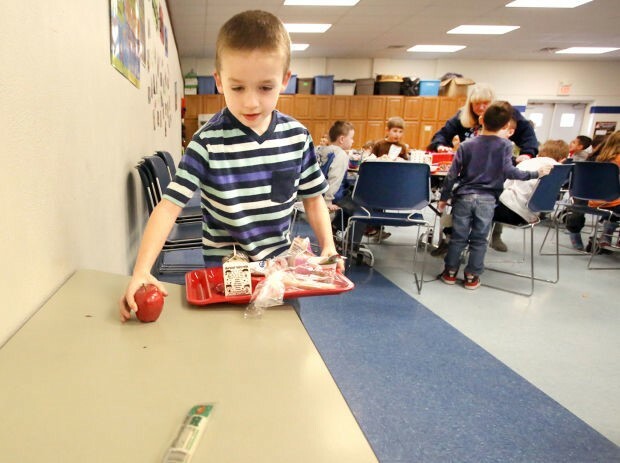 The USDA also encourages schools to save leftover items from the sharing table for another meal service or to donate those items to a local food pantry. 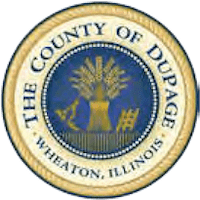 In DuPage County, SCARCE director Kay McKeen has met with the DuPage Regional Office of Education, the DuPage County School Nurse Network, as well as the DuPage County Health Department to discuss food sharing programs in schools. All three organizations are in full support of these efforts. A number of schools nationwide have already begun food sharing programs. Be proud to join the growing movement to reduce food waste in our schools and feed hungry kids. Check out the resources below – feel free to drop us a line too – and get started! A food share bin near the waste sorting area. A school food sharing cart.